What are the available fuel for the oil gas fired boiler? Oil gas fired boiler could burn both liquid fuel and gaseous fuel. The liquid fuel could be heavy oil, light oil, diesel, furnace oil, bunker oil, LPG (liquefied petroleum gas), etc. The gaseous fuel could be natural gas, city gas, bio-gas, etc. Whether the boiler can burn dual fuel or multi-fuel? Sitong boiler have oil burner, gas burner, and oil&gas dual fuel burner, we can offer the specific burner based on customers’ requirement. What is the texture of spirally corrugated tube? The texture of spirally corrugated tube is 20#. The brands of burner are Italy Baltur, Rellio, Elco, etc. What is the thickness of combustion chamber? the thickness of corrugated furnace is different based on working pressure and furnace diameter, generally, the thickness is between 10~18mm, large combustion space, and combustion sufficient. What is the advantages of fire tube boiler? This fire tube boiler has compact structure and convenient operation, strong load adaptability, lower water quality requirement, and the failure rate of it is lower than 0.1! Details of electric control cabinet. Electric control cabinet adopts PLC touch screen, display in English. It shows working condition details of boiler, such as water temperature, water pressure, exhaust gas temperature, and over-pressure alarm, etc. In addition, the cabinet is used for set up the parameter, record and analyze the operation data, etc. What is the inlet pressure of gas burner? The inlet gas pressure is different for different capacity boiler, for example, the pressure for 2 ton steam capacity boiler is about 8~10KPa, while for 4 ton steam capacity boiler is about 18~20KPa. What is the combustion mode of oil gas fired boiler? The combustion mode of oil gas fired boiler is chamber combustion. Together with air, the powered fuel (solid fuel – coal dust), atomized fuel (liquid fuel – oil), and vaporized fuel (gas fuel – natural gas) is sprayed into furnace (combustion chamber) for suspension combustion. 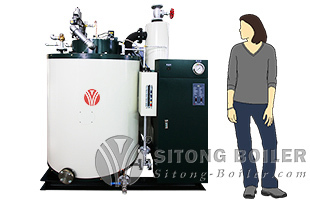 Differences between fire tube boiler and water tube boiler. What tube boiler also called shell boiler, the flue gas flows in fire tubes or smoke tubes, and heat the water, steam or the steam-water mixture outside the tubes. Compare with the water tube boilers, fire tube boilers have relatively smaller steam capacity, between 0.5~20t/h, and working pressure is between 0.7-1.6Mpa. This fire tube boiler has compact structure and convenient operation, strong load adaptability, lower water quality requirement. Water tube boiler refers to the boiler that water, steam or the steam-water mixture flows in the tubes, and fire or the smoke are combustion and flow outside the flues. 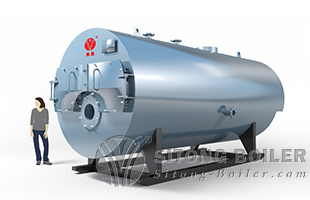 Compare with fire tube boilers, water tube boilers has the features of larger steam capacity and pressure, better heat transfer property and higher combustion efficiency, otherwise, the requirement on water quality is higher. Difference between wet back and dry back structure. Wet back structure refers to the drum, tube plate, and backboard in reversal chamber are surrounded by water. It can adapt to the high temperature, and has a good sealing, at the same time, it increase the radiation heat transfer area and improve the heat transfer efficiency. While, there is no water interlayer in the dry back boiler, and the backboard of reversal chamber is composed of refractory material, it is easy damaged by the high temperature. When select the model, the environment condition (temperature and elevation) should be considered, correct the burner output curve when the environment condition is different.